LOCATION LOCATION LOCATION!! 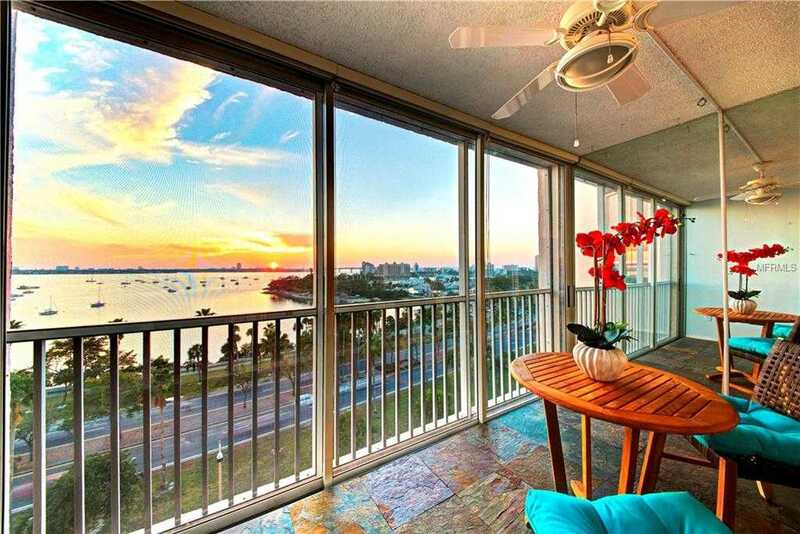 SPECTACULAR, unobstructed water-views of Sarasota Bay from every room within the unit. Facing west, this unit is located centrally in downtown Sarasota. Marvel over the panoramic sunset views spanning Sarasota 8217;s beautiful John Ringling Bridge all the way to Midnight Pass and beyond. You will always be within a 5-minute walking distance of Sarasota 8217;s best amenities; Main Street 8217;s eclectic dining, shopping, music, and art galleries. Palm Ave offers the fine arts and shopping(rear entrance of the building). Marina Jacks and Bayfront Park and located across the street. Burns Court and Laurel Park, both historical districts, offer beautiful historical homes, independent theater, restaurants, and shopping. Selby Botanical Gardens is located one block away. The unit also presents itself as the perfect location to enjoy Sarasota 8217;s best kept cultural and geographic luxuries; art galleries, opera and theater, Siesta Beach (#1 beach in the USA), Lido Beach and Longboat Key. 13; 13; Recently UPDATED with new porcelain tile flooring, this spacious unit features, and in-unit washer and dryer (grandfathered in), and a 50-gallon water heater. 13; 13; This building offers 24-hour security, concierge service, and has a very active social calendar for its residents. For example; book club, happy hour every Friday night, monthly birthday luncheons, in-house plays, 24-hour free shuttle, holiday festivities and more. The Regency House is truly a vertical-village. Please, send me more information on this property: MLS# A4427928 – $599,000 – 435 S Gulfstream Ave #902, Sarasota, FL 34236. I would like to schedule a showing appointment for this property: MLS# A4427928 – $599,000 – 435 S Gulfstream Ave #902, Sarasota, FL 34236.